Hi. We fished 3 kilometres north of Rimmers road Muriwai last Sunday afternoon, the 14th of September. There was a constant northeast wind blowing, about 20 knots, and we set only 5 hooks baited with salted pilchards to about 1 kilometre out. After only 20 minutes we retrieved it with 1 nice snapper and 2 gurnard. Quite good we thought off only 5 hooks. I went out in that awful storm on Tuesday. p.s. Thought you might be able to use this photo somewhere. Jeff Wright stopped in at the shop a couple of days ago and reported on his latest catch while kitefishing from Kariotahi Beach during the end of August. Jeff set a large dropper rig baited with salted bonito and landed one snapper and three spikey dog fish from 19 hooks set. While the numbers of fish weren't anything to write home about, the snapper was a real beauty and weighed in at 7.2 kgs. Further north, kite fisherman Nigel Farrier was fishing his longline rig at Glinks Gully on August 28. During an incoming tide, Nigel set 15 hooks almost straight offshore and wound up with three very nice snapper for the day. The kite fishing in Wellington has been very good over the past three months with plenty of gurnard, kahawai, tarakihi and elephant fish being caught using the longline.I have a few photo's of the elephant fish which I'll email to you this week. Last week I went out on the south coast after a big southerly swell. There was a lot of kelp about, and surfcasting would have been extremely frustrating, so I pulled out a pocket sled kite and attached it to my daiwa VIP rod, with sealine SL50SH reel, filled with 30lb braid. Whilst setting the pocket sled up and getting ready, a few fisho's turned up and started surfcasting. They were soon pulling in a lot of weed, just as I had expected. Seeing this, I shortened my dropper rig and replaced the 3 x 4/0 hooks with 3 x 3/0 KL hooks and a firm squid bait. Within 30 minutes I pulled in three huge winter kahawai, much to the surprise of the surfcasters, and was home in time for Mazda outdoors and gone fishing with smoked fish for dinner. Many thanks to you, Peggy and the team. 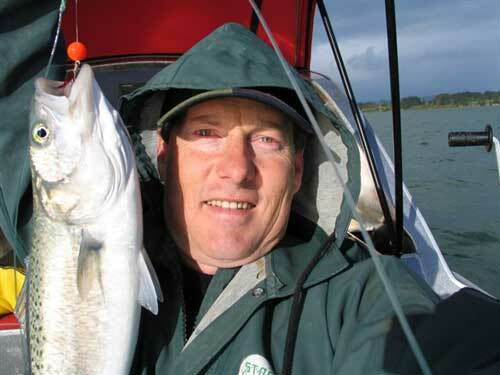 Aaron Buxton of Orewa recently sent in this area report to help out kitefishers planning to fish this area. Orewa Beach can sometimes be difficult to kitefish due to the turbulence that comes from the extremely tall pine trees along the shore. The best place to launch your kite is about the middle of the beach where the toilets are. Once the kite is flying at the optimum height move approximately 50 meters to the right where it is all clear for fishing longline rigs. 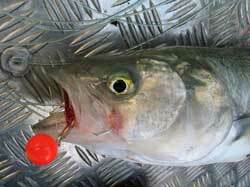 The best fishing time from Orewa Beach is at first light until about 9 to 9.30 am and the best bait is fresh mullet. I have fished here a lot and get good fish all year round. It's been very poor fishing here throughout the winter but looks like it's starting to pick up again now. My friend Maurice put his Flexiwing out on Monday the 8th of September, 6 hooks at 1000 metres out using salted mackerel. Maurice landed a nice 4kg snapper. A kontiki fisherman setting 15 hooks at 1000 metres and using squid also got a large snapper on the same day. I put my kontiki out on both the 12th and 13th of September, setting to around 1000 metres out both times, running 14 hooks and using salted mackerel. I ran one set on each day and got a 1kg snapper and three gurnard. September 3rd was blowing a moderate southwest wind and Les headed out to Papamoa with his kite longline rig. Baiting up 25 hooks with trevally and setting during an outgoing tide, Les wound up with four gurnard and six kahawai. Of the 10 fish caught, three of the gurnard were caught on traces with floating beads and four of the kahawai were on floating beads as well. Les generally uses 10 floating bead traces per set. Because of their success he plans to increase that to 15 or even 20 per set soon. If you go fishing, please send in a report and make Peggy's job of putting a newsletter together easier. All fishing reports are welcome. They do not have to be recent. Any information about your kitefishing, surfcasting, boat, kayak or kontiki experience is welcome. If you want photos returned include you mailing address.